Maori Name: Kihikihi wawa, matua kihikihi, ngengeti. Cicada song heralds the arrival of summer and is a celebration of seasonal change and regeneration. 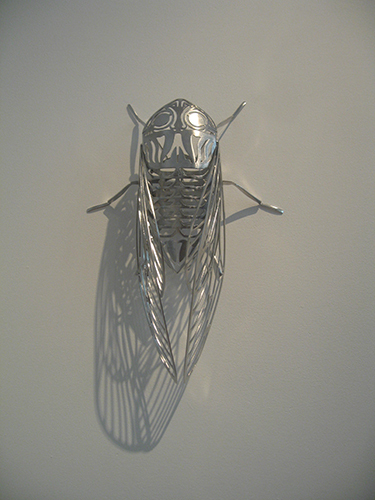 Throughout history, the cicada has provided a rich metaphor, symbolising resurrection, immortality and transformation. In Greek they are called Tzitzikia, and are known for their distinctive tzi-tzi noise. In Maori, the cicada is called Tātarakihi or Kihikihi. Kihikihi-wawā refers to the sound the insects make. Wawā meaning a loud roar or rumble. While only the male cicada sings, cicadas make the loudest sound in the insect world. 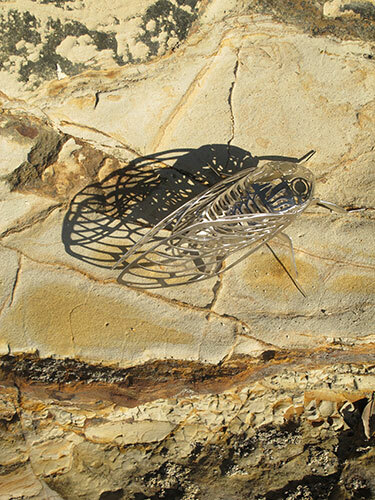 Image: Brick Bay Sculpture Trail.